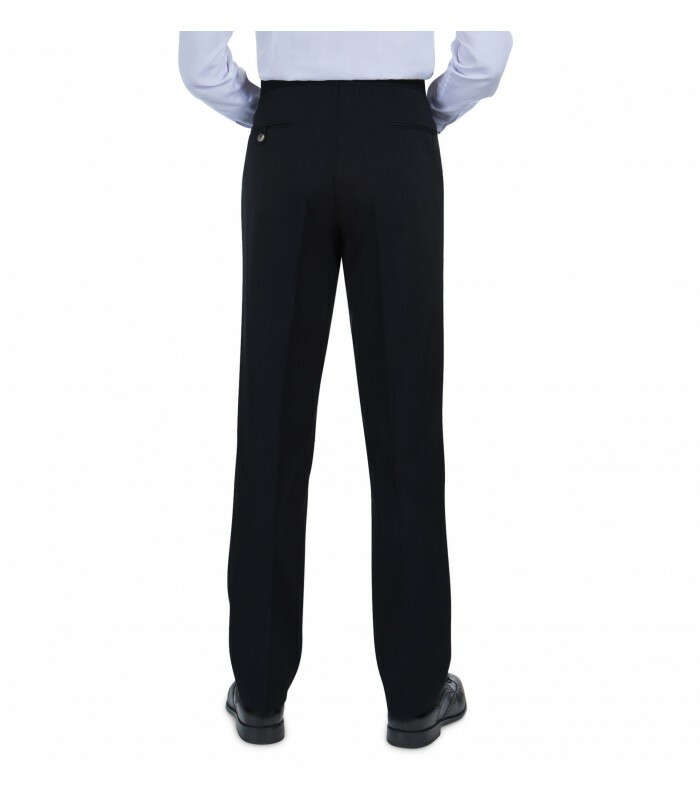 Tight stitching found in bespoke tailor shops keeps seams, pockets and crotch area well-reinforced. Inner Hook and Eye and inside Button to keep the front flat and smooth. Machine wash or handwash in lukewarm water. Hang to dry or tumble dry low and remove promptly. Cool iron, if needed. **KEEP THE SEWN BACK POCKET SHUT FOR A SMOOTH LINE: We offer one pocket sewn shut for a streamlined look and to prevent sagging. We recommend using the other button pocket for wallets, etc. If you want to open it, use a tiny pair of cuticle scissors or a seam ripper and carefully cut, stitch by stitch. You asked for a heavier-weight pant, and here it is--a gab twill similar to the '2043' model, with improved silkier fabrication that makes it feel better against your body and drape beautifully. 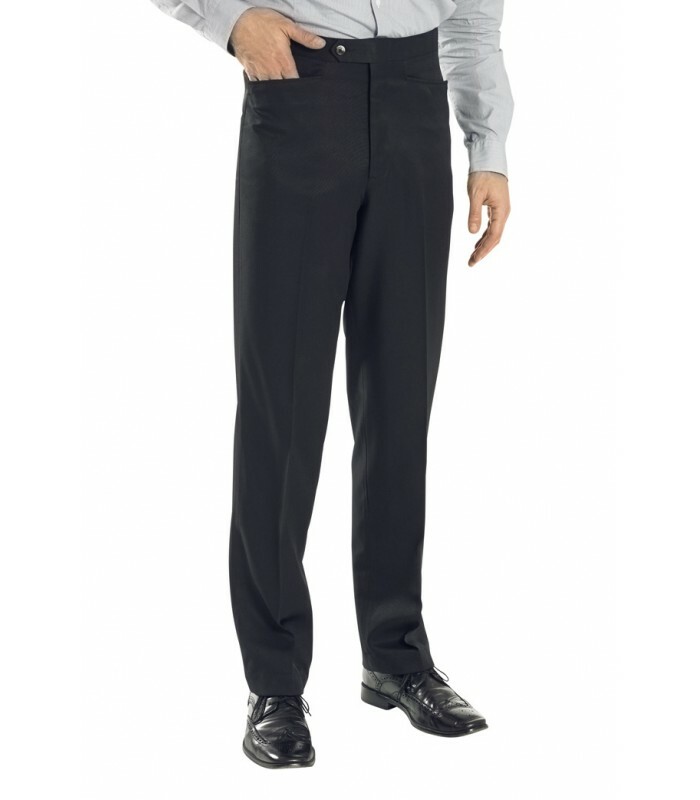 Back in the day, Sansabelt called this workhorse the "REF" PANT. Combine this wardrobe staple with a pullover sweater or pair it with a crisp white shirt and be ready for any occasion. In rich black only. Scotchgard protection and moisture wicking. Roomy, straight leg fit. 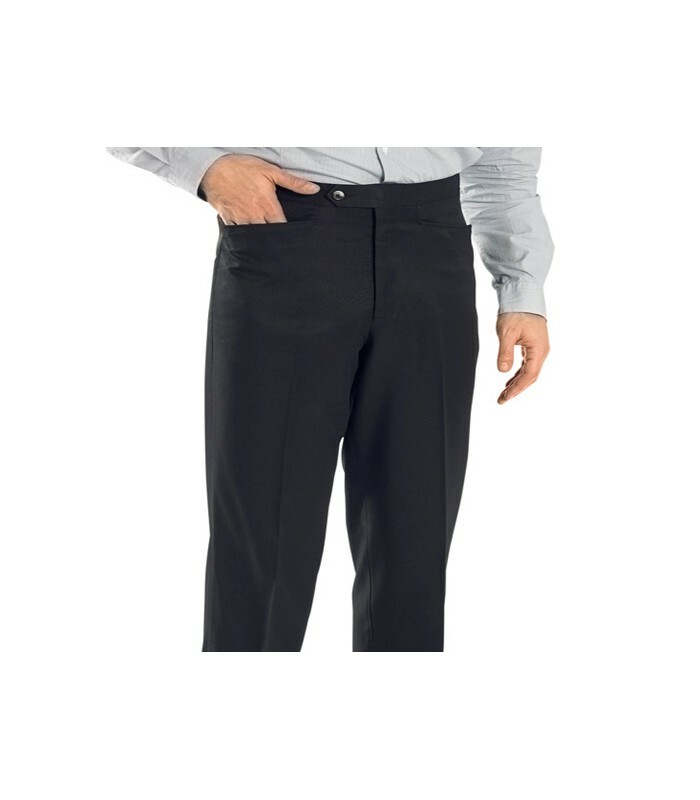 Our exclusive SANSABELT 2 1/2" Comfort Elastic Waistband smooths your midsection and keeps your shirt neatly tucked in! It's sturdy enough hold up to sweat, pressure and twisting and to withstand dozens of washes. 25-50% off on SANSABELT products! We hate spam too. 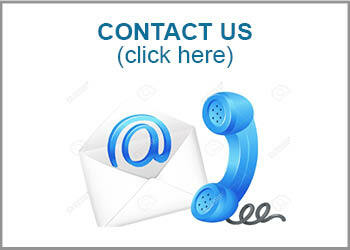 We promise we will never sell your email address to other companies. You have the option to unsubscribe at the bottom of every email. Kathy really helped me. When you were out of stock in my size, she found me other fabrics. Thank you for your product review on our website. We always welcome feedback, whether it is positive or negative. Please note that we will be bringing in new inventory on a poly/twill that has some spandex. We think you'll love it. 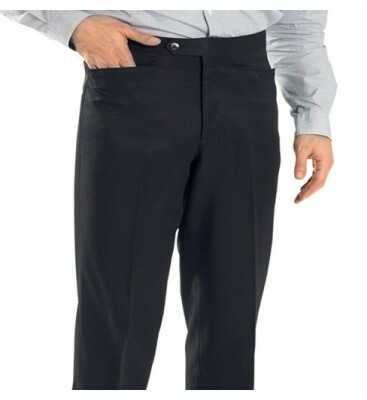 I wear these daily as a server in a top restaurant and they are great around the waist. No pinching and no need for tight belt even tho I added belt loops. 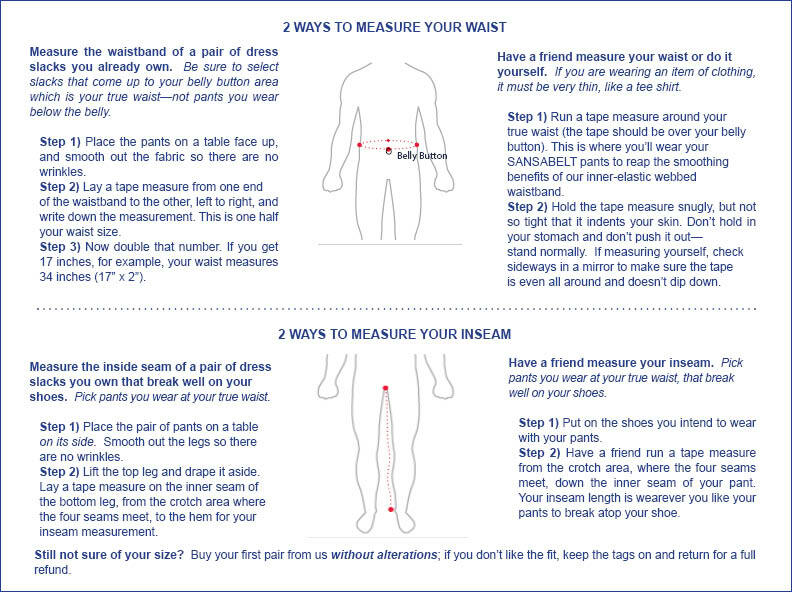 I am a size 46 and can't order bec either I am screwing up or you have no stock. I have the other style with the side pockets. I just took a peek at our inventory on hand and we do have 8 pair in a size 46 in black. Please give Dawn a call at 1-844-475-2257 and she can help place an order for you. I wish you had this pant in white or a cream color and maybe a light blue. 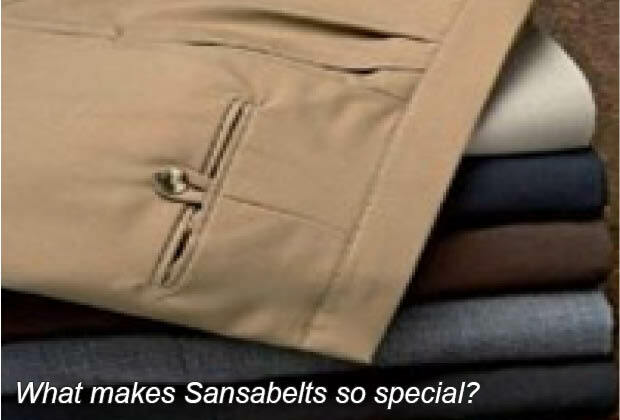 I own 12 pair of Sansabelt trousers and will have no other in my wardrobe. Thank you for your product review on our website. It's always nice to hear kind words from our loyal customers. Keeping them cause the waist is so comfortbale. This fabric is not too light which makes it more casual which is what i like. I work as an electrician and the waist flexibility is great. I have them as shorts and pants and they REALLY LAST. I wear them to my bowling league and they get a real workout! !